A Morning Sentinel portrait of the community during the holiday. It is the morning of Christmas Eve in Waterville. The recent ice storm has knocked out the power of nearly half the residents of Kennebec County, bringing some of them back to a simpler time of wood heat and candlelight. 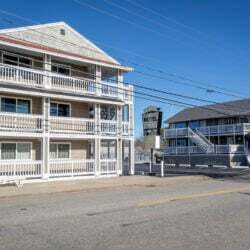 Waterville, virtually unscathed by the power outages, remains an oasis of light and power amid the vast swaths of blackness of many surrounding communities. 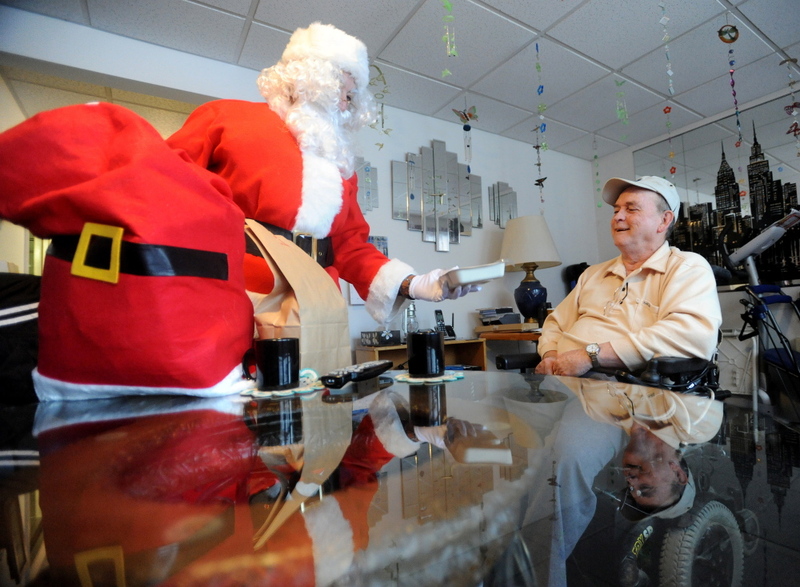 Staff photo by Michael G. Seamans SPECIAL DELIVERY: Romeo Remy, 69, gets a special Meals-on-Wheels delivery at his apartment at Elm Towers in Waterville from Santa Claus on Tuesday, Dec. 24, 2013. 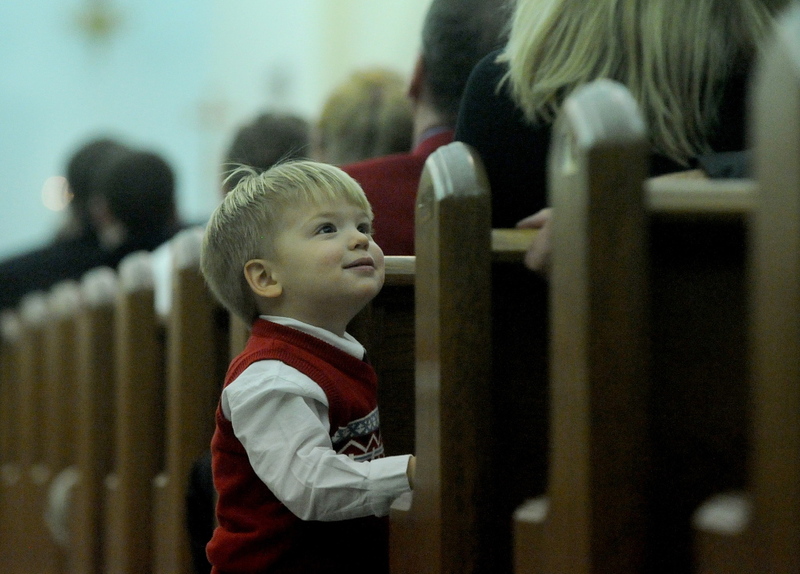 Staff photo by Michael G. Seamans CHRISTMAS IN WATERVILLE: Brody Jabar, 1, looks to his mother for some entertainment Heather during the Christmas Eve Liturgy at St. Joesph's Maronite church in Waterville on Tuesday, Dec. 24, 2013. Staff photo by Michael G. Seamans CHRISTMAS IN WATERVILLE: Seats are filled at the 7th annual Central Maine Family Christmas Dinner at the Elk's Lodge in Waterville on Wednesday, Dec. 25, 2013. Staff photo by Michael G. Seamans CHRISTMAS IN WATERVILLE: The trademark hay rides for patrons of the 7th annual Central Maine Family Christmas Dinner drives down the icy tunnel of Industrial Parkway in Waterville on Wednesday, Dec. 25, 2013. 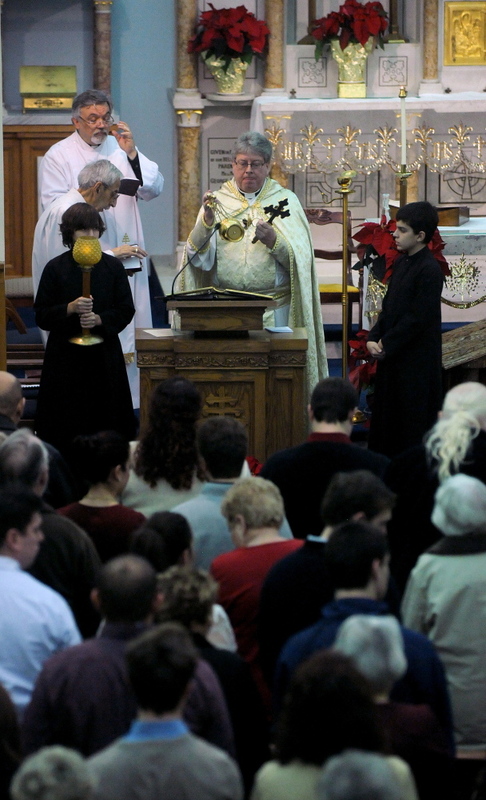 Staff photo by Michael G. Seamans CHRISTMAS IN WATERVILLE: Father Larry Jensen gives the Christmas Eve Liturgy at St. Joesph's Maronite church in Waterville on Tuesday, Dec. 24, 2013. 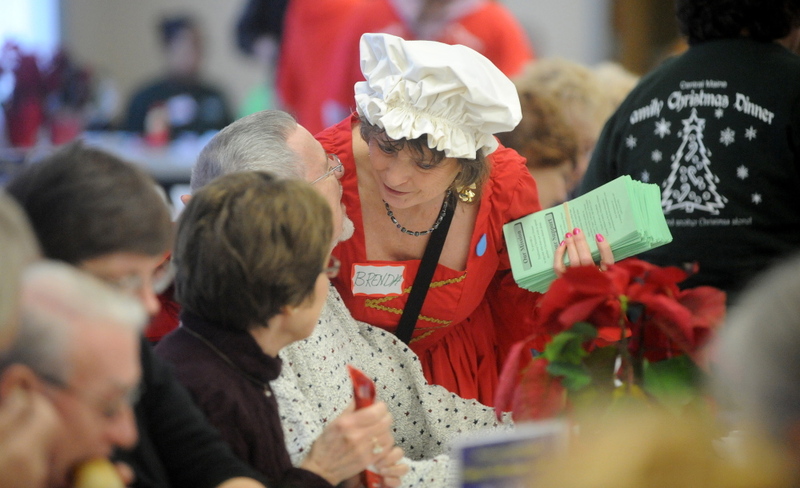 Staff photo by Michael G. Seamans CHRISTMAS IN WATERVILLE: Brenda Blair, a dinner volunteer, shares a moment with a patron of the 7th annual Central Maine Family Christmas Dinner at the Elk's Lodge in Waterville on Wednesday, Dec. 25, 2013. Organizers were expecting as many as 1000 diners this year. The roads are mostly clear and dry, offering safe passage through the winter wonderland nature has created. The frost-covered branches of fir trees slump downward, covering their bare patches and making them look like idealized images of a Christmas tree. The tops of birch trees of a certain diameter bend all the way to the ground, forming an arbor complete with ice-coated chandeliers of branches. With glistening surfaces extending all the way up to the brilliant treetops, it is hard to imagine a whiter Christmas could be possible. At the Muskie Center on Gold Street, volunteers are busy working for the Meals on Wheels Program, one of hundreds of social service agencies throughout the region, the Muskie Center is a hotbed of do-gooders, breeding acts of kindness. At 7:30 a.m., volunteers are busily putting together packages of food to take to seniors who need them, working on the stainless silver tables of the kitchen, with silver ladles and whisks and spoons dangling above their heads. They know that, in some cases, they will be the only visitor their clients receive on Christmas Eve. In preparation, retired road maintenance worker Roger Derosier, a lifelong volunteer who has put in time at the Human Society, the Red Cross and Habitat for Humanity, has donned a full-length Santa Claus outfit. He and the other workers raise their voices to be heard over the constant rustle and snap of hundreds of lunch bags, which are being filled, assembly style at a blistering pace, with butter and rolls, a four-bean salad, milk, fruit juice, chicken pot pie and fresh Christmas oranges. They talk about the work, and about the weather. A woman wearing a blinking Christmas tree around her neck and another blinking ornament around her wrist tells Derosier that another volunteer has called in, which will add a chunk of Fairfield to Derosier’s workload for the day. “By myself?” he asks the volunteer in disbelief. It’s a lot of deliveries for a man who is planning on carrying the food in a festive red sack. A fresh volunteer walks in the door and grabs a couple of bags to fill. “Welcome to the loony bin,” a woman says, dryly. At a Circle K convenience store on Kennedy Memorial Drive, young mother Dani Wright, 27, wishes all of her customers a merry Christmas. She operates a cash register behind a counter that includes, among other seasonal items, a candy bar the size of a laptop computer. “I’m so excited,” she says, emphasizing the word so with such force that her shoulder-length brown hair bounces in the air. The high point for her will be when her 3-year-old daughter unwraps a tool set. Some of her friends scoffed at the idea of buying a tool kit for a girl, but she knows what her daughter will like, she says. When the tool set is revealed, it is clear that both mother and daughter will be equally excited. 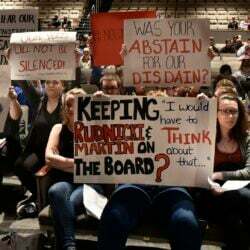 Over on Morrill Avenue, Jim Dickson speaks on the phone from his home. He lost power on Monday evening, and spent the night at his father-in-law’s house in Oakland. After borrowing a generator from his in-laws, he returned to the home this morning and spent 20 minutes installing it. He says he didn’t feel any anger — just relief. Holidays allow families to spend quality time together, and for the Carcieri family, their quality time is in the gym. At a local fitness center, Frank Carcieri, 61, says they don’t let the holidays disrupt their workout routine. Frank works out four days a week, his broad-shouldered and bearded son Alfred, 25, works out five or six, and his red-haired daughter Stephanie, 28, works out every day. Alfred and Stephanie live out of state, but the holiday is allowing them to spend some family time together, in the gym. They are loud, boisterous, and fun. Inside Elm Towers, a drab public housing project on Elm Street, Romeo Reny, 69, sits alone. Two days ago, he scoffed at the idea of the holiday. Reny, who came from a broken home, says he was wild when he was younger. In all, he’s had seven wives. “I don’t mess around,” he says. But he hasn’t had a drink in 44 years. That was when, while driving drunk, he caused a horrific car accident. “I killed two girls,” he says. There is a buzz from an intercom in the wall. Reny uses his arms to direct his wheelchair there, pressing the button to allow someone through the lobby. A minute later, there is a knocking at the door. “Come in,” he says. There is no response. “Come in!” he repeats, twice more. When the door finally opens, it is Roger Derosier, the Meals on Wheels volunteer, dressed as Santa and running late. Derosier zips inside, drops a meal from his red sack on the table, wishes an amused Reny a merry Christmas, and hurries out in the space of 30 seconds. A few days ago, he was dour about Christmas, but a few minutes after Derosier leaves, he turns to Don, a maintenance man he’s become friendly with. At Inland Hospital, Simon Gibbs, a surgeon, is between operations. A large man with a gray beard and a distinctive British accent, Gibbs has been working since 6:30 in the morning. The hospital’s doctors have only scheduled minor procedures for the day — a couple of orthopedic surgeries and excisions of skin lumps. He says he doesn’t mind working on the holiday. With the ice storm leaving so many without power, Gibbs says, the hospital is taking special precautions. Business is brisk at Jin Yuang, a Chinese restaurant that opened on Temple Street a few years ago. They are open regular hours today, and will be open regular hours tomorrow, on Christmas Day, feeding an emerging culinary tradition popularized in movies and television shows. Two women leave the restaurant, walking carefully on the snow and holding large paper bags of steaming food. As they get behind the wheels of their respective cars, one makes plans to meet back up with the other. “I can’t believe it’s Christmas Eve!” she practically screams before popping into her car. At St. Joseph’s Maronite Church on Appleton Street, nearly every pew is filled for a Christmas Eve Liturgy from the Rev. Larry Jensen, whose furnace began making strange noises last night. He decided not to make the repairman come out into the cold night, he tells the congregation, instead keeping warm with quilts from his mother and father. In the same way his parents kept him warm last night, he says, God keeps his children warm. At the back of St. Joseph’s, Heather and Jason Jabar are trying to corral their four young children, including 1-year-old Brody. “We come every year,” Heather whispers, smiling. Triplets Lauren, Giselle and Jackson, all age four, are dressed in their best Christmas outfits, not a stain or wrinkle visible on the girls’ poinsettia-print skirts or Jackson’s patterned red sweater vest. In the church, Jensen begins to lead the congregation in a hymn. “I think it’s time to go back inside,” Heather says to the girls. “And you can wait here for a minute and then come back in with Daddy,” she tells Jackson. Friends and college students Sarah Johnson, 20, and Joelle Rossignol, 21, sit on small stools in front of the counter at Flagship Cinemas, where they work. 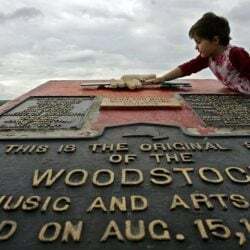 They compare Christmas traditions and planned presents as they meticulously pull small plastic letters from bins and use them to update a faded sign on the movies of the week. It is one of the more tedious parts of the job, but not the worst. Yesterday, workers had to chip the ice off of the large marquee sign out front to change the letters there. Johnson’s family eats seafood every Christmas Eve. She is most excited to give her boyfriend his present, a Legos Star Wars-themed kit. In a few hours, Rossignol says, her mother will get her and her four sisters a set of pajamas to wear on Christmas morning, as she does every year. “It’s a secret,” she says, rolling her eyes. She hopes her twin 11-year-old sisters will like the Pokemon shirts she has gotten them. Over the past few days, they say, they have sold thousands of dollars worth of gift cards to Christmas shoppers, some of whom have made going to the movies a part of their family Christmas tradition. Rebecca Powell comes into the Flagship Cinemas, the final customer of the day and a regular patron. She buys four gift cards worth $25 each. The presents are for her sister, brother, and parents, but they’re not from Powell. 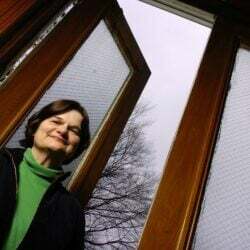 They’re from Miguel, her 3-year-old son, who loves his aunt, uncle and grandparents. For Powell, it is the last stop of a busy day. And tomorrow is Christmas. It is Christmas in Waterville. Before dawn, even a major road like Kennedy Memorial Drive is quiet, with the red and green glows of the stoplights caught in the ice-covered treetops and taking on a festive look. If exchanges go as planned, Gibbs’ daughter will be opening a pair of Doc Marten shoes; fitness enthusiast Carcieri will be watching his daughter unwrap a Kitchen Aid mixer and his son open boxes of clothes that he wanted; the 3-year-old daughter of gas station clerk Wright will be opening her tool kit; Johnson’s boyfriend like his Star Wars Lego set, and Joelle’s twin 11-year-old sisters, both wearing their Christmas pajamas, will be opening Pokemon-themed shirts; 3-year-old Miguel, having given his Flagship Cinemas gift cards to his relatives, will be excited to receive the Leap Pad his mother has gotten him. At 6:30 in the morning, the lobby of the Waterville Police Department is quiet. A snowman carved of wood, alongside the message “Season’s Greetings,” sits behind the bulletproof glass dividing visitors from police staff. In a conference room, Lt. Lincoln Ryder holds a briefing session with four officers. He ticks down the business of the day — a domestic violence followup, one officer has to process some shoplifting reports, another has to do some traffic accident paperwork. Some of the officers have their own families at home waiting for them. Officer Timothy Hinton says he has some paperwork to serve, but he’d like to put it off. At Notre Dame Church on Silver Street, Corpus Christi Parish is holding a Christmas Mass, as it has every year since 1970, when the church was built. About 150 devout sit in pews in the cavernous interior, surrounded by exposed brick, wood, religious iconography and . A nativity and dozens of poinsettia plants are front and center as the pastor delivers his Christmas sermon. When Riley makes noise, those sitting in front of her turn, and smile. Lakewood Nursing Home, a crucible where men and women are sometimes asked to meet the most difficult challenges of their lives. A successful round of physical therapy can make the difference between independent living and dependence. Sometimes, it makes the difference between life and death. Last Christmas, life was easy for Clarence Hannan, 68, of South China, who retired recently after 37 years with Huhtamaki. Then, he had the whole family over on both Christmas Eve and Christmas afternoon, two children, nine grandchildren, and his first great-grandchild. Now, he lays prone on a hospital bed. A plastic tube delivers oxygen to his nose, and he closes his eyes when he’s not talking. Complications from a July surgery left him near death at Massachusetts General Hospital, where he spent 101 days in poor condition. Now, he is getting better, slowly but surely. In October, he was transferred to Lakewood to begin his physical therapy. Every day, twice a day, he sits in a wheelchair and works his feet in a pedaling device that looks like the bottom part of an exercise bike. The staff tells him he is making progress, but he isn’t satisfied. This Christmas, his wife, Elaine, has come to visit, with their Chihuahua, Sweetie. With Elaine looking on, he offers his philosophy of life and death. “I think when your time comes, it’s going to come,” he said. The best one can do is to be graceful and brave when that time comes. “I don’t know if I’ll be brave when the time comes, but I hope I will,” he says. He indicates his wife with a nod. Lakewood administrator Shannon Coro says Hannan’s hard work has been a source of inspiration for the staff. If he continues his hard work, she says, he may be able to walk again. Lying on his bed, Hannan grins. He would settle for a cold beer, he says. Winslow resident Nick Brown and five or six others stand in the cold, just outside the home of relatives he is visiting on Mount Pleasant Avenue. They are watching a thick cloud of smoke rise a few blocks away. Police interrupted the family’s Christmas gathering to ask them to clear cars off the road to make for easier access to the fire, which has already consumed most of a building on Drummond Avenue. After speculating about the source of the fire for a few minutes, they return to their home. 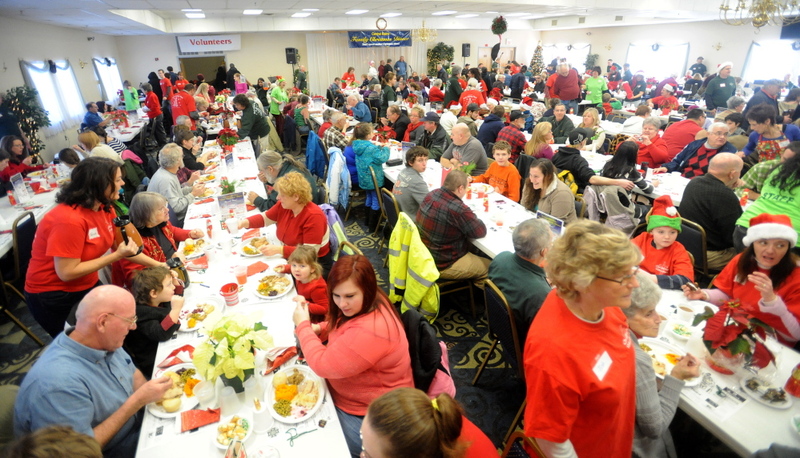 It is the Seventh Annual Central Maine Family Christmas Dinner at the Elks Club on Industrial Drive. 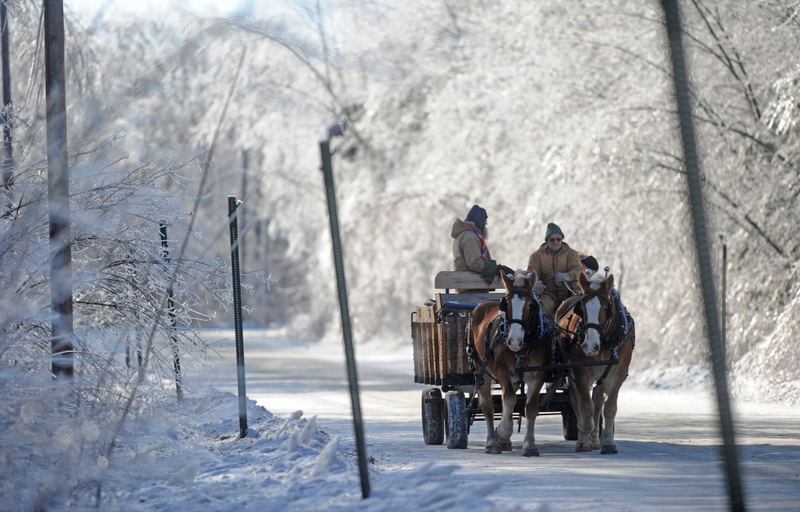 As many as a thousand people have already come to eat, carol or take a ride in a horse-drawn wagon. Inside, a swell of warmth and music and good cheer awaits all who enter. Hundreds are seated at long tables, eating heaping plates of turkey, mashed potatoes, cranberries, peas, and rolls. At the front, a woman picks up a microphone. Everyone cheers and claps. Before the applause has died completely, a bathroom door at the rear of the dining hall bangs open and 7-year-old Zachary Wentworth shoots out into the crowd, hiking up his pants as he looks left and right for the familiar costume of Santa Claus. Wentworth makes it to the front of the room in time to be the fifth in a rapidly forming line of children waiting to take a picture, chat with Santa, and receive a stocking of presents. Minutes later, standing alongside his mother, Michele Grotton, of Oakland, a volunteer at the dinner, he happily nuzzles the small stuffed dog he received. At the dinner, about a dozen people some of them also serving as valets, wait inside and outside the entrance hall, offering greetings and handshakes and, for some, hugs. As they slowly make their way down the hallway, the smiles on the faces of sisters Rita Poulin, 78 and Mary Rose Poulin, 76, grow wider with every greeting and handshake they receive. “There must have been 10 of them,” Rita Poulin says, in the thick French accent the sisters have carried with them all the way from their homeland of Canada to their current home of Waterville. But that’s okay, she says, because you can never have too much Christmas cheer. Certainly not on this day, not during Christmas in Waterville, in a room where a community of a thousand souls have come together to celebrate the joyous holiday’s good cheer.